Actress Jiang Peiyao to replace Charmaine Sheh in Line Walker 2 Movie. A spin-off from the popular drama series, 2016’s Line Walker: The Movie <使徒行者> starred Nick Cheung (張家輝), Louis Koo (古天樂), Francis Ng (吳鎮宇), Charmaine Sheh (佘詩曼) and Benz Hui (許紹雄). Although Francis Ng’s character was killed in the first movie, he still appeared in the sequel’s promotional activities. However, Charmaine Sheh was conspicuously absent – she is currently filming a Mainland Chinese drama and won’t be able to film for the movie. Instead, taking her place as first female lead is rising Mainland actress Jiang Peiyao (姜珮瑶), who plays a kind and responsible journalist in the movie. Entering the industry for only three years, 24-year-old Jiang Peiyao has already starred in several big productions opposite heavyweight co-stars including Louis Koo, Takeshi Kaneshiro (金城武), and Eddie Peng (彭于晏). An outstanding student, Peiyao is a graduate of the Beijing Film Academy. She was recommended by her school as a master’s student in research studies and received a scholarship award for it. 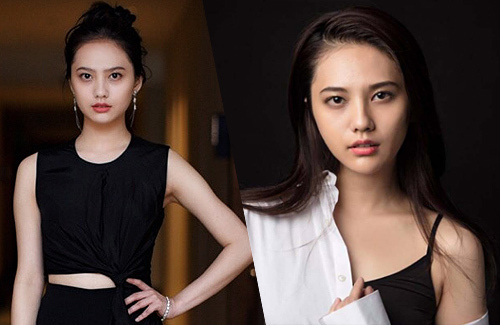 Despite her relatively short time in the industry, Peiyao has already taken part in two productions led by acclaimed director Feng Xiaogang (馮小剛), and was also part of the movie Sons of the Neon Night <風林火山> directed by Juno Mak (麥浚龍). Peiyao worked with acclaimed actress Sylvia Zhang (張艾嘉) in the movie Tropical <熱帶往事> last year. She also starred with Darren Wang (王大陸) in the movie A Better Tomorrow 2018 <英雄本色2018>. While Jiang Peiyao’s name might not be familiar to the Hong Kong audience, her management company J.Q. Pictures Limited is heavily focused on the Mainland Chinese market and has invested in many productions such as The Golden Era <黃金年代>, Dearest <親愛的>, Soul Mate <七月與安生> as well as the Line Walker film franchise. Set to be filmed on location in Hong Kong, Spain and Myanmar, Line Walker 2: The Movie <使徒行者2:諜影行動> will continue to explore the undercover cop theme and is helmed by Andrew Lau (劉偉強), who co-directed 2003’s Infernal Affairs II <無間道2>. i thought nick’s character died or so as it might have seemed to be…. pointless they should have reboot it or name it something else.. no one from the actual SERIE is in. Stupid idea. Oh my…the kings are getting old. She is so young looking standing next to them. Better than being an anemic paleface. @mike old kings. francis ng and nick cheung seems to have aged a lot. It feels like Hong Kong movies always feature the same actors. from Charmaine to this unknown?